Fall is almost here, which means one of the most beautiful times of year in Colorado is at our doorstep. Did you know Colorado is considered to be one of the best places in the country to see fall foliage? The very best time to see the fall leaves is probably the last weekend of September through the first week of October, but the colorful season goes on across the state for an entire month. Starting in mid-September at the higher elevations and stretching into the middle of October for lower areas, trees across the state begin their transformation into an array of gold, orange, and red. And you won’t want to miss the magnificent palette of autumn leaves that comes with the changing of the seasons. But Colorado is a big state, and some places are better for viewing fall colors than others. That’s why we’ve put together this handy list of our 5 favorite places to see autumn leaves across the state, plus where to stay and how to get there. Fall is just around the corner in Colorado! ?? Here’s a little throwback from when I visited Maroon Bells in Aspen a few years ago during the peak fall colors! So beautiful! ? 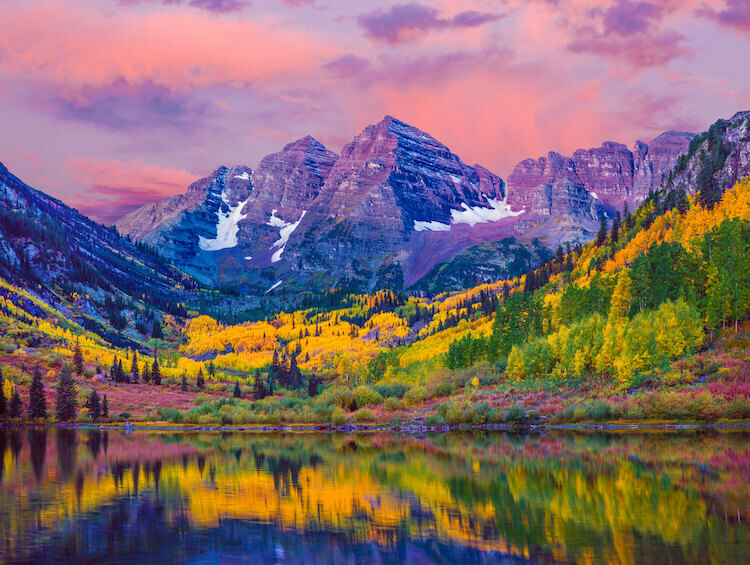 If you need an excuse to go to Aspen this fall, the Maroon Bells are it. The name comes from two bell-shaped mountains formed from a red shale rock that gives them a maroon color. This gorgeous landscape is situated in White River National Forest, just over 10 miles away from the picturesque town of Aspen, Colorado. You can also try out one of the many hiking trails in the area for a close-up view. Aspen has no shortage of luxury accommodations. A few we’d recommend are Hotel Jerome, The St. Regis Aspen Resort, and Hyatt Residence Club Grand Aspen. Start with a private flight into the Aspen/Pitkin County Airport, where you can hire a shuttle or limo service to your accommodation. When you’re ready to take in the splendor of Maroon Bells, you’ve got a few options. You can hire a private chauffeur, take the popular Maroon Bells bus (which runs through October 8th this year), or drive there yourself. Situated along the edge of the Rio Grande National Forest in southwestern Colorado, the Dallas Divide is a great way to see the changing leaves on and around Mt. Sneffels and Dallas Peak. At over 14,000 feet, you may be afforded the beautiful view of Mt. Sneffels shrouded in snow, a beautiful contrast to the golden aspens you’ll find here. Around the end of September into the beginning of October is one of the best times of year to catch peak color. Plus, this view is just a short trip from the iconic town of Telluride. That means you’ll be able to find a great place to stay and enjoy a night out after your autumnal viewing excursion. For the best Telluride has to offer, check out The Hotel Telluride, The Peaks Resort and Spa, or The Lumière Hotel. Fly via private charter into Telluride Regional Airport. They’ve got a range of ground transportation options for you to get to your accommodation. Telluride offers its fair share of views, but for another scenic day trip, take a drive west out of town on Highway 145, then head north on Highway 62. If you keep going, you’ll run into Highway 550, otherwise known as the Million Dollar Highway, where fall colors are abundant. You can grab lunch in Ouray before completing the loop to Telluride. Georgetown and Silver Plume are a pair of quaint Colorado mountain towns just about 45 minutes west of Denver. 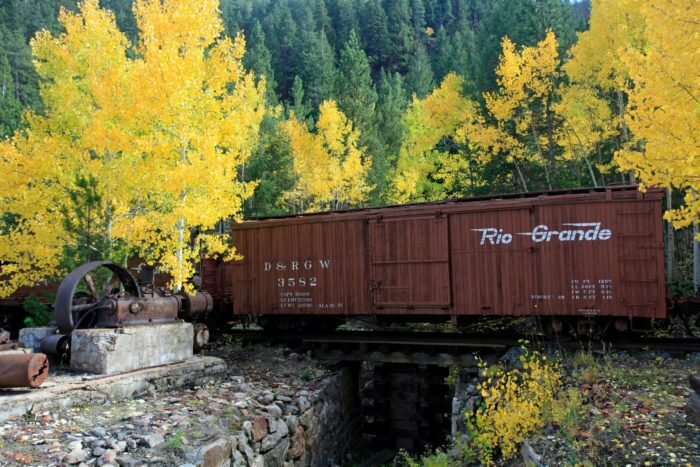 The Georgetown Loop Railroad gives you the chance to see the fall leaves from a train car pulled by a vintage steam locomotive along winding mountain tracks. For an authentic mining town experience, try out the Rose Street Bed & Breakfast in Georgetown, or the historic Windsor Hotel in neighboring Sliver Plume. For something a little more modern and cosmopolitan, Denver’s Ritz-Carlton or Four Seasons will provide a weekend of luxury. Either way, be sure to make grabbing a cocktail at the outstanding Bread Bar (named for its location in a 19th century bakery) in Silver Plume part of the agenda, before or after the train ride (or both!). Fly private and land just west of Denver proper at the Rocky Mountain Metropolitan Airport. From there, hire a chauffeur or rental car to your accommodation in Georgetown, Silver Plume, or Denver. If you stay at the Four Seasons, they can handle your transportation to the hotel. You can take the Georgetown Loop Railroad from either the Silver Plume or Georgetown station. Getting to the station is just short walk from either town. Located just northwest of Denver and not far from weekend favorites Boulder and Fort Collins, Rocky Mountain National Park is truly epic in scope: 415 square miles of mountain perfection, stacked with 300 miles of hiking trails to explore. RMNP is host to the highest elevation continuously paved road in all of North America, Trail Ridge Road. With much of the path resting at over 11,000 feet, and peaking at 12,182 feet, this road will take you all the way from Estes Park to Grand Lake, with astounding autumn foliage the whole drive. And if you decide to hike one of those trails, you might get to see or hear an elk, as this time of year is elk rut season. If you’re heading to this part of Colorado, you’ve got to stay at the Stanley Hotel, known for inspiring Stephen King’s book The Shining after he spent a night there. On the other end of Trail Ridge Road, Grand Lake’s Gateway Inn offers suites with a view. Take a private jet into the Northern Colorado Regional Airport (near Fort Collins) or the Boulder Municipal Airport, each about equidistant from Estes Park. From there a rental car or chauffeur service is your ticket to accommodations in the park, from which you can access Trail Ridge Road. Our final recommendation to capture the season is by driving the Peak to Peak Scenic Byway. The 55-mile stretch will get you beautiful views of the Continental Divide, from Estes park through Nederland and Clear Creek. While in Nederland, be sure to stop into The Train Cars Coffee, housed in vintage circus train cars, and warm up with their spicy green chili and signature house donuts. Past Nederland, the byway will take you on to the 19th century mining town turned gambler’s paradise, Central City, before finally ambling into The Gateway of the West, Golden, Colorado. Those stops make this a perfect weekend trip to see the some of the best fall colors our state has to offer. For a cozy adobe stay with some mountain-sized margaritas in the on-site restaurant, try the Table Mountain Inn in Golden. For the high-end spa get-away, nearby Boulder has got you covered with the Hotel St. Julien. If you fall in love with Nederland, the Boulder Creek Lodge offers a more rustic getaway. If you want to get in on a game of Texas Hold ‘Em between checking out the fall foliage, then the Ameristar Casino Resort in Black Hawk is for you. The Boulder Municipal Airport is closest to most accommodations. From there, you’ll want to rent a car or hire a private shuttle service to take you where you want to go. Mountain Aviation offers chartered flights or the opportunity to hop onto empty legs of already scheduled flights. And if you’re thinking that there’s no way you could afford to fly private, think again. The idea that seats on private planes are just for the elite is a myth: the tickets don’t have to be as expensive as you might think.